Lots of compact crossover purchasers are turning to the 2017 Chevrolet Equinox, available for sale in Oklahoma City and Pauls Valley. It’s a versatile option that can be had in a variety of powertrains and with either front- or all-wheel drive. In addition, while it is a pretty big vehicle, it offers excellent fuel economy. The Equinox for 2017 is almost the same as it was last year. It got its key safety equipment updates in 2016, along with a stylish new look. There is nothing too controversial in the 2017 model, just a bit of front fascia treatment, some new chrome, and some nice touches. All in all, what you get is a more attractive and brighter looking Equinox. We see it from the exterior as a smaller version of the Chevy Traverse. The Equinox is a little thicker and has borrowed some additional styling elements from the brand’s trucks. It is still, though, more like a car than a truck, and it can proudly hold its own in design next to Chevy sedans. The 2017 Chevy Equinox, available in trim levels of L, LS, LT, and Premier, is an SUV in the compact crossover style. Coming standard with the Equinox L model are the expected 17-inch alloy wheels, cruise control, cloth upholstery, automatic headlights, a driver’s seat with power height, air-conditioning, a tilt-and-telescoping wheel, a trip computer, and a second-row reclining and sliding seat split at 60/40. From an onboard technological standpoint, the standard L has Bluetooth phone connectivity, a 7-inch touchscreen, in-car 4G, OnStar, and a six-speaker audio system that comes with a USB port and auxiliary audio jack. The next model up, the Equinox LS, is the sibling of the L but with new and enhanced features. The most notable of these are the all-wheel drive option for traversing all weather conditions. The exterior upgrades include different wheels and body-color door handles and bumpers (both with a gray trim). The interior provides a compass, satellite radio, and there’s a towing package option. The Chevy Equinox LT adds to the LS with heated mirrors, roof rack side rails, body-color mirror housings, LED running lights for the daytime, and an upgrade to MyLink (Chevy’s infotainment system), Bluetooth, smartphone integration, and voice controls. The top Equinox model, the Equinox Premier, increases the alloy wheels to 18 inches, and adds chrome accents to the exterior trim, driver memory settings, auto-dimming rearview mirrors, fog lights, leather upholstery, remote start, heated front seats, automatic climate control, and an eight-way power driver’s seat. Those who upgrade to a V6 engine will also receive a firmer suspension tuning. LT models also can have a Convenience package, which is optional and adds some features from the Premier trim. These include leather-wrapped steering wheels, the power driver seat, automatic climate control, heated seats, and a remote start. A power liftgate may also be ordered. For those wanting their Chevy painted black, the LT Midnight is available. It comes with driver memory settings and 18-inch wheels and leather upholstery, both of which are painted black. Another option, the LT Sport, repeats the LT Midnight package but instead has white exterior paint. The higher-end LT and Premier also have an optional sunroof, technology package (an eight-speaker audio system from Pioneer and a navigation system), and a Driver Confidence Package, which provides blind-spot monitoring, and both parking sensors cross-traffic alerts for the rear of the vehicle. The Premier does have two additional options as well: the Enhanced Convenience package, which gives an eight-way power front seat on the passenger side and a powered liftgate, and the Driver Confidence II package, which is a safety package adding forward collision alert and lane-departure warnings. Since 2010, the Equinox has not changed at all, mechanically. The small Chevy crossover comes with a choice of a 4-cylinder or a V6. The base model comes standard with the inline 4-cylinder engine that puts out 182 horsepower and has a displacement of 2.4 liters. The engine is very advanced for a vehicle in the crossover class. It is also very efficient, with direct injection and a 6-speed automatic transmission, on top of variable timing on the valves. The little crossover can also go 0-60 in just around 9 seconds, according to Chevy. If you need something a little bit tougher, then you may want to go with the optional V6. It has a displacement of 3.6 liters that puts out 301 horsepower and delivers torque at 272 ft-lbs. It is definitely the only option if you are going to be towing or need the added performance. The V6 does have a slightly lower fuel efficiency rating than the inline 4-cylinder base model. The option is available to add all-wheel drive to either of the engine choices, although you do add an additional one hundred pounds in total mass. First gear is very low when compared to other crossovers. This allows the Equinox to achieve faster take offs. It also features cogs that are taller than average to help with higher gear and fuel efficiency handling. Overall, the six-speed transmission has it all under control. The all-new 2017 Chevrolet Equinox is amongst the most fuel efficient cars in the non-hybrid compact crossover section. 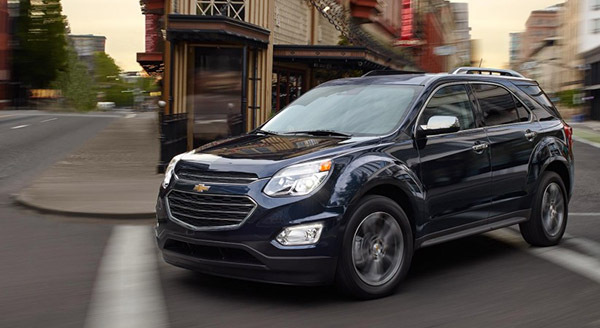 The best Equinox model to maximize your miles per gallon or mpg is the standard 4-cylinder with front wheel drive. The average Environmental Protection Agency mpg ratings for this option are a healthy 21 mpg for city driving, an impressive 31 mpg for highway motoring and 25 mpg for combined driving (21/31/25). For car buyers who need extra grip and control, the all-wheel-drive (AWD) option offers excellent stability with fantastic fuel economy (EPA mpg ratings 20/28/23) that is almost on a par with the front-wheel drive option’s mpg. In contrast to most non-hybrid compact crossovers, the 2017 Chevrolet Equinox is also available for purchase with a powerful 3.6-liter 6-cylinder engine. This option is available with AWD and has solid EPA fuel economy ratings (16/23/18 mpg) that again almost match the front wheel drive (17/24/20 mpg). The V6 Equinox is suitable for traveling on difficult terrain and towing on steep inclines. The 2017 Chevrolet is a superb all-rounder with excellent fuel economy across a wide range of models. The 2017 Chevrolet Equinox is a family- and user-friendly, smaller version of the Traverse. It borrows small design features from some of Chevy’s trucks, but it still remains more car-like in appearance. The sheet metal look and sophisticated profile are the same as past years, and just as popular as ever. The front end got updated a bit in 2016, and the vehicle looks even more attractive and modern. So what are the changes? Now, the Equinox has the dual-port grille that other GM vehicles carry. In addition to this, the lower front fascia has a cleaner, more molded look and reflector style headlights were added. The LT and LTZ models also have LED running lamps. The LTZ added foglights, and V6 models received a sporty touch with new chrome exhaust outlets. Add new wheels, more chrome, and updated lower fascias, and the Equinox is looking good for 2017. The back end of the car didn’t get left out—the taillights now have the two-square appearance of other Chevys and the LTZ trim incorporated chrome trim, of course. On the inside, the chrome comes into play again. The shift buttons got a touch to add some light to the cabin, the instrument panel received a new graphics design and the center stack was redesigned to include a handy storage shelf. The search for the perfect family vehicle can be exhausting because there are so many factors to take into consideration. Is there enough space? Is it comfortable? Can it accelerate to beat the morning traffic crunch? Is it easy to clean? Well, for a lot of families, the answers to these questions can be found by looking at the 2017 Chevrolet Equinox. Now, there’s no third row of seats, because the Equinox is, in fact, a compact crossover, but it is surprisingly roomy inside. It’s also much easier to maneuver in close quarters (an important feature in the school drop-off line) than its larger brethren. The lucky passengers in the front of the vehicle have supportive seats that are comfortable on all models of the Equinox, but those looking for an upgrade can find one with the LTZ trim, which has cross-stitched, perforated leather upholstery. Those in the back won’t suffer, however, because there’s plenty of head- and legroom and the seat back reclines. The bench seat slides backward and forwards a full eight inches to offer either extra room for passengers or more cargo space. None of the trims are built with cheap materials, but instead use quality materials that can stand the test of time. The cabin is quiet and elegant due to the noise-cancellation system in place that muffles road noise while on the highway. There’s also triple door seals and sound damping glass to keep the weather out and keep your family cozy. The ride is smooth and even, perfect for those long road trips to your ideal vacation destination. Included are a retractable cargo cover and net to secure and hide all of your belongings and keep them safely stowed away. There’s also a large center console to hide your phones, purses, and wallets. Designated as a Top Safety Pick by the IIHS in 2016, the 2017 Chevrolet Equinox for sale in Pauls Valley near Oklahoma City has received “Good” scores in all safety categories, including the small-overlap crash test. The optional crash mitigation system received a “Basic” score by the IIHS. Starting in 2016, Chevy made rearview cameras a standard feature for all trim levels as well as including newly optional active safety items, which brings the Equinox level with its in-class competitors. While many of the safety features on the Equinox come standard in all new cars, such as electronic stability control, head-curtain and pelvic airbags, four-wheel disc brakes, and OnStar emergency systems, Chevy takes it a few steps further. Lane-departure warning and collision warning systems are now more widely available in the inline-4 and V-6 models and are now standard on the LTZ model. Blind-spot monitors and rear cross-traffic alert systems were added to the 2016 LT and LTZ trims.